Cruise ships are not able to dock here, you will be tendered ashore to the Novotel Hotel. There are shuttles to take you into town about two miles away, or you can walk. Exmouth, Western Australia. The town was originally established to support the Communications base located at the North West Cape. While the base is still operating at a reduced capacity the town has reinvented itself as the gateway to Ningaloo reef making it a top tourism destination. Tourism is now the major industry contributor to our economy. At Exmouth, you can simply don your mask and snorkel and swim out in shallow waters to see the parade of colored coral on the Ningaloo Reef. Or if the lure of the big fish is your holiday dream, head offshore to net yourself a prized catch. Even though the town is small and it is possible to go around on foot, everything is fairly spread out. Walking from one side of town to the next may prove a fair trek, especially in the summer. Emus still wander through the main streets and parks of Exmouth. Tours from Exmouth include swimming with whale sharks, whale watching, wildlife spotting, scuba diving, sea kayaking, fishing and coral viewing from glass-bottom boats. It is surrounded by endless beaches, national parks, and arid beauty. You can always find a beach and a reef to have to have nearly to yourself. 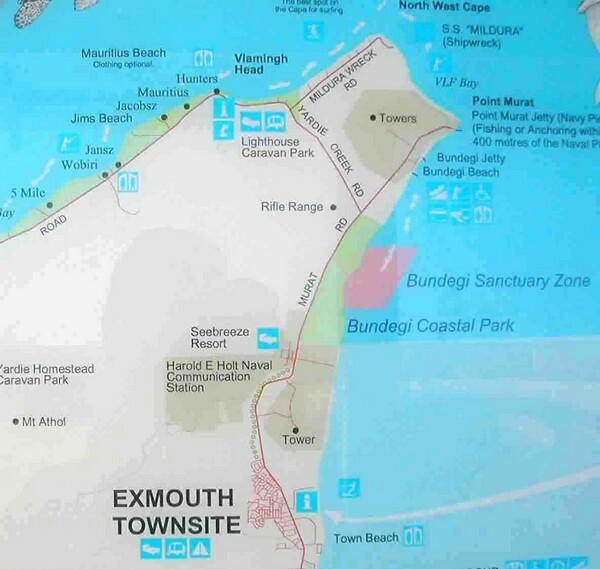 Exmouth is a small town of around 2500 people, with a population that doubles with the temporary workforce associated with the 4 month tourist season. It has supermarkets (7 days a week), coffee shops, dive shops and a couple of fashion stores.